Health and Safety Software helps organisations manage compliance with functionality such as risk assessments, maintenance checks, incident reporting and training. Good H&S software should make legal compliance efficient and ensure that there is an audit trail. It should also be good value for money. When choosing health and safety software there are various different providers and decision making can be difficult. 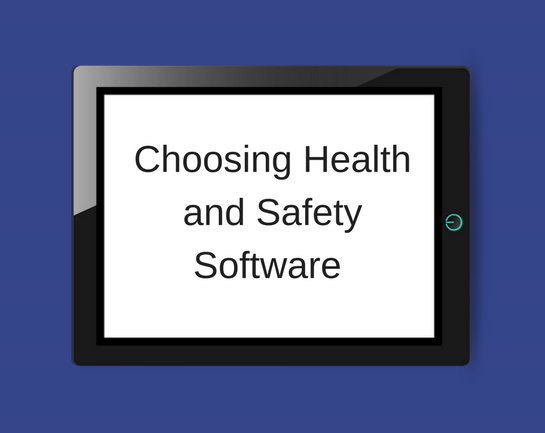 This Blog Post outlines key things to think about when choosing Health and Safety Software. Health and Safety Software can be tailored to the needs of your organisation from schools and universities to healthcare and hospitality. The level of tailoring and customisation depends on the provider. Equally for services such as consultancy, assessment, safety equipment supply and servicing the provider’s background and experience should be carefully considered to ensure it matches your sector requirements. – Document management, policies etc. – H&S Training Courses, topics covered, bespoke development. The above summary highlights the key things that should be considered when choosing health and safety software. Additionally software demonstration and free trial periods should be taken before making a decision to see which software is right for you. Ultimately, price is a key factor and if suppliers also offer services such as on-site assessment, audits, training, consultancy, fire equipment supply etc. Packages can be negotiated and significant cost saving can be achieved. We hope that you choose the solution that it right for you. Safesmart’s Smartlog Software caters for many different organisations requirements and the fact that we are the only Preferred Supplier for the Association of School and College Leaders (ASCL) and a NASBM approved partner highlights the suitability of our software for varying environments that feature in the education sector. As well as the education sector we supply NHS establishments and work with various care homes and hospitality venues. As well as online software, Safesmart also offers fire equipment: inspection, maintenance and installation for things like: extinguishers, alarms, fire doors etc.